MMillennia is made with beef, pearled barley, brown rice, peas and other nutritious and wholesome ingredients. No meat by-product meal, corn, wheat, soy, sugar, artificial preservatives or flavors added. Solid Gold MMillennia Beef & Brown Rice Recipe With Peas Dog Food is formulated to meet the nutritional levels established by the AAFCO Dog Food Nutrient Profiles for Maintenance. Wonderful food!! Doggie loves it. No allergic reaction. Thank you for sharing your Solid Gold story! We're so happy to hear that you have found a food that works for your guy. We wish you both many more years of happiness and good health! My dog is allergic to chicken and I have had the hardest time finding a good for him. I kept him on this food and he loves it, and has been very healthy. I have attempted to change food, thinking he would like a change now and again, but haven't found anything comparable and always switch him back. So glad to find a supplier after moving! Thanks for the love and loyalty, Moriah! We're glad to hear that your dog has had such a great experience on Mmillennia! 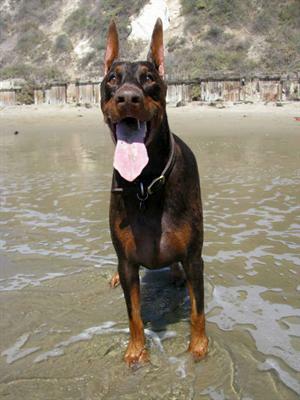 My Doberman has multiple food allergies! He's allergic to chicken, lamb, potato, sweet potato and rabbit; the hypoallergenic / novel protein / limited ingredient diets from the vets only made it worse! However he can eat beef, barley, rice so my husband and I were relieved to find this diet. He has been eating it for a few years now and while we monitor his food allergies through ACTT the food holds up to the gold standard 6-8 week exclusive diet test. Thank you for making my dog's poops normal, his ear infections resolve and his coat look good. And please, don't change it! Just like people food, now all dog foods seem to have to add "Natural Flavor" ingredient into the food. Even though this "Natural Flavor" is better than an artificial flavor, it is still an ingredient created in a laboratory with hidden ingredients that do not have to be revealed. Its bad enough that so much of our processed human food has this natural flavor in almost everything and now even dog food has to have it? Dog food did not used to need this natural flavor ingredient so why does it now? Solid gold is a very good brand but it seems to me it is being influenced and I am going to stop buying it after I use what I have.